The moment you load the Magic Shoppe Slot you might feel that you have been transported back a century and entered a mysterious, slightly gothic store full of wonder. 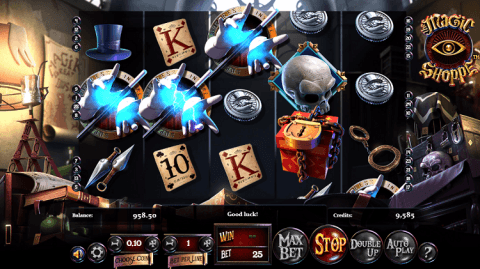 In this new BetSoft slot game you have padlocked boxes, handcuffs, a skull alongside the gloved hands of a magician, each designed with flair. As you would expect from BetSoft, the gameplay is varied and enjoyable throughout. You will enjoy a unique wild feature and a free spins bonus round which can be activated by one of two different symbols. For readers outside the US, Unibet Casino is the place to find all the best BetSoft slots – along with more than 500 titles from all the major slot software houses. You can get up too. Check out www.unibet.com for to check out Magic Shoppe now! This BetSoft designed slot plays out on five reels and pays from left to right on each of the 25 win lines. Players will choose both the coin value and the bet per line, which will be multiplied by the 25 lines to give a total stake for each spin. A look at the pay table shows you that you’ll need to land at least 3 in a row of any symbol to land a win. The top paying standard symbol is the skull, worth 1,000 coins for the maximum 5 in a row. The handcuffs are next on the pay table, with a top prize of 800 coins, while a pair of vials, a silver coin and a black top hat are joined by ancient looking playing cards A, K, Q, J and 10. The wild symbol in the game is represented by the word ‘wild’ housed within a bronze ring. This symbol will substitute for any other in the game apart from the two scatter symbols, hopefully bringing many additional wins. This wild is also the highest paying symbol in the entire game, with a top prize of a very impressive 2,400 coins for the maximum five in a row. Throughout the base game you’ll find a pair of padlocked boxes appearing on the reels, one in a deep red color and the other in a glowing blue. The red boxes represent the sun and the blue boxes represent the moon and land three or more of either anywhere on the reels and you’ll find yourself entering the free spins feature. The minimum three scatters wins you 3 free spins, while four scatters doubles this number to six free spins and the maximum five scatters doubles it again to 12 free spins. These free spins are no normal free spins however, as each will be guaranteed to be a winning one (the only time you won’t win is if the spin retriggers the feature, adding more spins to your existing total). Players will also find the ‘The Magic Wand’ feature, which is activated when you land the same symbol three times across any of the reels. This is where the game goes ‘wild’ crazy, as each of the three (or more) magic wands will now automatically become wild, as well as any sun or moon boxes as well. After all of these symbols have turned wild, the reels will now be re-evaluated and you’ll hopefully pocket a nice pay-out. The final feature in the game is the gamble-after-win option. After any win you can choose to hit the ‘double up’ button, which will take you to a screen showing a bronze coin. You can choose to gamble the whole of your win amount, or just half, all on the toss of a coin. Get it right and you have doubled up, get it wrong and your win is gone. Throughout your play you’ll be very impressed with the design of this slot. The game is atmospheric and dark throughout, while each of the professionally designed symbols only adds to the slightly haunting mood of the game. There slick animation throughout the game and a sound track which only enhances the atmospheric nature even further, while the title of the slot floats eerily in the top right-hand corner of the screen. The Magic Shoppe is an involving and enchanting slot. You’ll immediately feel like you’re in another world, and entering the kind of shop which Harry Potter might enter when looking for a wand, only that bit darker. The visuals are excellent throughout, while the gameplay is entertaining and has an originality, especially during the two main features. Having a free spins bonus round where every spin is a guaranteed winner is a very nice touch, while the added wilds in the ‘Magic Wand’ feature is sure to land some nice oversized pay-outs. Overall this makes for a highly recommended slot – give it a spin and watch the magic in action. You can find Magic Shoppe, along with more than 500 other slots from BetSoft and all the major slot software houses over at www.unibet.com – claim your free spins and check out the games now! More Amazing New Slot Games!